I made Baked Cod and Fennel in a Package the other night and had some of the fennel left over and decided to make a side salad. 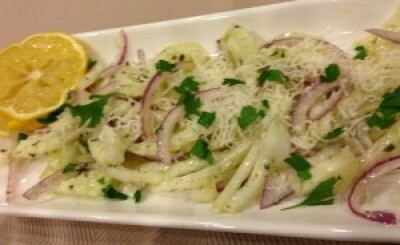 All I can say is that this fennel and parmesan salad was the perfect side to my main dish! In bowl add in fennel and red onion and drizzle in olive oil, lemon zest and lemon juice then combine together. Then add in thyme leaves, parsley and 2 tablespoons of parmesan cheese. Add fennel salad to your serving bowl and top with remaining parmesan cheese and any extra parsley.